Taking these steps to organize your business will increase the focus and accountability of your people. Do you find yourself so busy trying to “do” business that you don't have time to manage your business? Do you find yourself simply “putting out fires” and not really making any progress during the day? Do you find that the systems and procedures you used yesterday no longer work and are ineffective because you've grown? Have you found that important business functions do not get done correctly or are done differently by different people in your organization? These are issues that a broad range of furniture storeowners and managers bring up time after time. As companies grow, things change. Small companies may not have many problems resulting from poor or confused communication and direction because there are fewer employees to deal with. Larger stores, and mid-sized chains have more people, more duties, more responsibilities, more sales and more deliveries. Without the proper direction and policies, they may also have more problems. Once a retailer realizes that associates do not really understand what his or her company stands for, where it's going, how it's going to get there, and what role associates should play, it becomes necessary to look closely at the following 12 elements. 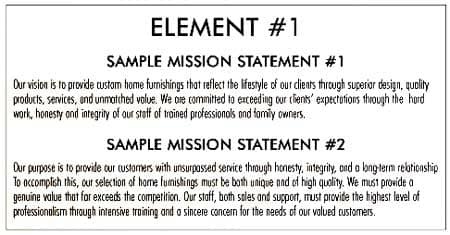 Some owners believe that a mission statement is simply a series of words that doesn’t accomplish anything. This is certainly the case if a mission statement is interpreted as a slogan or an advertising promotion. This tool only works if it is sincere, truthful and really represents the culture of an organization. It must represent the core and foundation of any company and be the common thread that unifies every individual and every process within the organization. This vital tool enables every employee to move in the same direction for all the same reasons. A proper mission statement/statement of values allows the organization to grow and evolve to the next level. 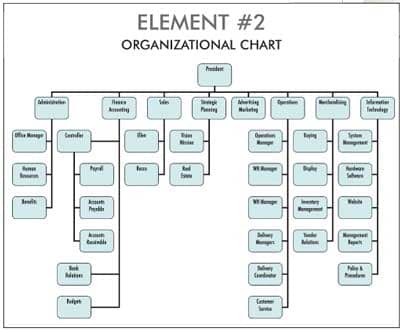 Once element #1 is in place and all associates have been familiarized with the basic focus and values of the company, it is time to review how the company is structured, what roles each department, manager and employee plays, and who reports to who. The goal, of course, is to create accountability. Associates in many retail organizations across the country do not work in environments where clear lines of authority exist. They will, therefore, have the opportunity to ask different managers or owners the same question, in an attempt to get an answer that they want to hear. In addition, without a defined chain of command, managers and supervisors will provide employees with conflicting information regarding the same problem or issue. When this occurs, everyone loses. There is inconsistency in procedure and inconsistency with instruction. This, of course, leads to inconsistency in the minds of customers. The next step after developing an organizational chart is to develop precise Job Descriptions that illustrate the duties, functions and responsibilities of each individual in the organization. Precise job descriptions enable all members of an organization to understand what management’s expectations are, and how department and employee performance will be measured and rewarded. A problem common to most retail organizations in our industry is that associates and managers find themselves doing everything. There is lots of redundancy in their roles. Nobody can be held accountable because no one is really in charge. You know when accountability is an issue when you hear, ”I didn't know that was my job. No one told me.” Even worse, organizations without job descriptions find that processes and procedures are consistently performed incorrectly. A similar problem may also exist at the department head level. Ill defined organizations find that department heads constantly tread water, and live from day to day without making progress toward organizational goals. Often, each department head will have his or her own agenda that has nothing to do with the goals and objectives of the company. In such organizations, poor communication between departments that are in conflict with one another will sabotage organizational goals, and nobody will even realize it. In order to unify the organization, bring departments together, and work as a team, each department needs to draft and adopt a Business Plan. These individual plans should be created with the objective of contributing to the main corporate plan. Sharing departmental business plans helps to foster teamwork, because every department head has access to information about the direction of every other department. Better interdepartmental directives give organizations a unified, clear direction. They also move organizations towards a goal-oriented problem-solving approach rather than a simple task orientation that emphasizes “putting out fires” and placing “Band-Aids” on problems as they occur. Once everyone is on the same page, departmental managers will better understand corporate expectations and expect to be held accountable for their performance. Another issue that plagues furniture retailers is a general lack of Communication. Most organizations have few written directives, policies or procedures. This creates problems when situations are handled in different ways depending on the person handling them. Inconsistency and uneven performance ends up being expensive for any organization, and more importantly, will cause it to lose business and sacrifice customer loyalty. Consequently, policies and procedures need to be put down in writing in an Operating Procedures Manual that will help to solve a number of problems endemic to retail organizations. When new employees have no written reference to guide them, they need to ask for help. The most common result is that the advice they get from co-workers or managers has a good chance of being inaccurate or inconsistent with corporate goals. Another problem that arises in the absence of a written reference guide is that routine verbal communication with Associates permit issues to “fall between the cracks” because initiatives and instructions fail to be clearly understood or accomplished. The old saying, “if it ain't written, it ain’t real” should be a motto for retail managers. Verbal instructions that are perceived as merely discussion, have limited short-lived impact. Whether you use hard copy, e-mail or voice mail, a defined communications process must be established to adhere to in every instance. When associates are given a hard copy reference, they will better understand the needs of the organization and their specific responsibilities based on those needs. The sales floor is an area that tends to breed inconsistencies and conflicts that can only be resolved with written Sales Floor Policies. Rules that guide the operation of the sales floor are necessary, not only for sales consultants, but also for managers. Without written guidelines, managers are given carte blanche to interpret corporate policies. Written rules give organizations a better chance of providing consistent responses to customers. This helps to avoid confusion and provides a better customer experience. Floor policies also provide sales management with the tools to illustrate performance expectations and eliminate “gray areas” of interpretation. A Policy and Procedure Manual is a critical tool to help organizations be more consistent, eliminate errors and reduce expenses. Every department should be responsible for the development of a precise procedure manual. As departments grow and add new people, the orientation and learning process becomes critical to its success. To create a policy and procedures manual is not an easy task. Someone within the organization must take responsibility as the “policy and procedure champion” and coordinate, organize and manage this process. Without the establishment of this tool, the ultimate loser will be your customers. They will receive inconsistent performance, and that in turn will decrease customer loyalty. Another area that plagues retail organizations is a lack of accountability. Once a structure is put in place, job descriptions established, and policies and procedures to be followed drafted, it becomes necessary to create some link to accountability for all those areas to be followed. That link is the establishment of clearly defined, and scrupulously followed Performance Reviews. 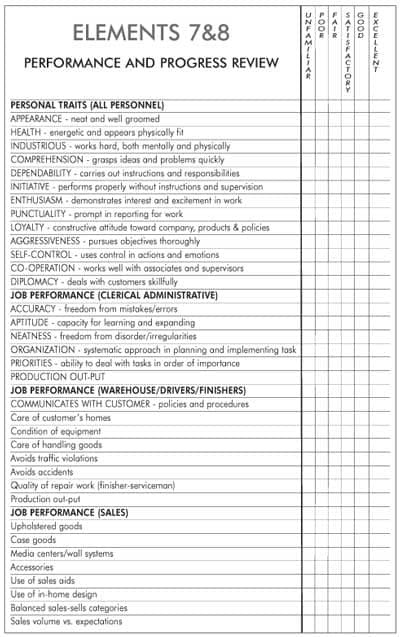 Owners and managers observe positive and negative employee performance on a daily basis that should be noted and placed in a file for each associate. Every staff member must understand that the creation of their job description is directly linked to performance reviews. They should also know that they will be measured and rewarded based on the fulfillment of the specific responsibilities listed in their job descriptions. This is where accountability is created, and where employee performance can be rewarded consistently. The most important asset for most organizations is its people; categorized as Intellectual Assets or Human Assets. Without successful and effective people, retail organizations cannot succeed. It follows, that when resources are not provided to recruit, interview and hire good people, organizations will eventually suffer. Jim Collins, in his book. ”Good to Great” stated that we must have the “right people on the bus and the right people in the right seats.” In other words, you can't put a square peg in a round hole. If you do not start with the right people, no matter what you do, you will not be successful. It is a simple point that eludes many home furnishings retailers. That’s why it is imperative that you develop an ongoing recruiting program. Recruiting is a 24-7 job. It is tough to educate people if they are not up to a task, so the time you spend recruiting, interviewing and hiring is critical. Spend time researching the interview process. Understand the pitfalls of an unprepared and not thought-through interview process. Be aware of issues like the “halo effect” which occurs when one strong characteristic of a candidate overpowers all other requirements. Above all start with a profile, then develop job descriptions and finally develop a checklist to evaluate how every candidate meets each job requirement. Once the proper people are in place, the establishment of an Ongoing Education Program is paramount to the effectiveness of your organization. An area of special concern is sales education. Current economic conditions and reduced retail traffic have created an urgency to take full advantage of every opportunity. The best retailers carefully measure floor traffic, closing rates and average sale. The productivity of each sales associate should be tracked and should include their ability to sell add-ons to build the sale, attract be-backs and build future business with current clients. Establish sales goals for each sales consultant that illustrates their “fair share” of the store’s monthly and annual sales goal. Keep in mind, however, that the productivity of sales people does not happen by itself. Do your part by creating an on-going sales education program that deals with the issues of developing relationships, consultative selling, providing answers and solutions, and becoming a partner with customers to help them make informed investment decisions. Because customer attitudes have changed along with their buying habits, prepare to be able to deal with and address these changing attitudes. In order for an on-going education program to be successful assign someone to be responsible for it and hold him or her accountable for its success. An area that receives very little attention is the proper direction, instruction and education of Warehouse and Delivery Crews. We are all aware that the front end generates revenue, and that the back end either generates profits or can sabotage hard-earned gains. This topic has been covered in detail in recent issues of FURNITURE WORLD, but there are still too many retailers out there who have not yet put their warehouse and delivery processes and procedures in writing. The procedures for pulling, inspecting, prepping and loading should be clearly documented with step by step instructions to eliminate guesswork regarding what needs to be done to satisfy your customers. Your delivery crews are truly ”ambassadors” and should be educated and given the tools they need to be as good as they can be. Acknowledge their importance, and reward them for superior performance so they are able to feel that they are ”part of the team”. The last area we will examine is Customer Service. Very often retailers don't really understand the objectives of customer service, which is to create customer loyalty and repeat business. Most retailers invest a great deal of money attempting to generate new business, but spend very little to maintain and keep loyal customers. Is there someone in your organization whose responsibility it is to be responsible for delivering effective customer service? Beyond that important element, consider your commitment to formally educating your associates so that they can properly communicate with your customers. Left to chance, each associate will deliver his or her own “brand” of customer service. Instead, they should be delivering “your brand”. Written policies and education are a start, but follow-up is required to measure the success of your efforts to ensure a consistent level of service and a maximum level of customer satisfaction. Successful customer service is as much of an attitude as it is a procedure. Attitude towards customers should not be simply a matter of being able to recite policy; it should be a constant effort to look for ways to find solutions and satisfy customers. Obviously, there are many more elements required for retail success but if you put all of these together and see how they are integrated and support one another, you will see the benefit in putting these 12 elements into place in your organization. Ron Wolinski is VP Performance Groups for Profitability Consulting. His expertise in management stems from the positions he has held such as Manager of Training for Art Van Furniture, Vice President of Sales and Marketing with Contact Interiors, President of Behavioral Dimensions, Sales Education for the Simmons Company, National Director of Education and Development for Value City Furniture and most recently, Director of Education and Retail Services for La-Z-Boy, Inc. He consults with retail organizations internationally on Consultative Selling, Communications, Leadership Skills, Organizational Development, Interviewing and Recruiting, and Customer Service. Questions relating to this article or to other related topics can be directed to Ron at rwolinski@furninfo.com. Read more of his articles posted to the www.furninfo.com website.